I have been told, on numerous occasions, that my guarantee to win a driver’s license restoration or clearance case was a big reason why someone decided to hire me. While I am grateful for that, I want to make clear that it is the quality of work that I do, and my confidence in it, that allows me to offer my guarantee in the first place. I’m proud of how my office does things; we do good work. It is just a given that anything of substantial quality begins with good ingredients. In my case, I always – and only – begin with a client who has really quit drinking and is genuinely sober. With this as a basis, I can, and do, mold every case I take into a winner. My guarantee is simple: If you hire me, you will win your license back or get your clearance. If, for some reason, your appeal doesn’t succeed the first time, I will represent you before the Michigan Secretary of State’s Administrative Hearing Section (AHS; formerly the DAAD) until you do. The deal here is straightforward: I make my money winning these cases the first time, not doing “warranty” work and having to come back and try again the following year. That’s double the work and half the pay. Thankfully, I have never had to go back a 3rd time. I have every bit as much incentive to win your license back as you want it back, and quickly, at that. The only “catch” is that my guarantee doesn’t apply if a client lies to me or withholds essential information. To date, I have never used an exception to my guarantee, but then again, I win almost all of my cases the first time, so that’s not a surprise. Thus, we begin with a person who has really quit drinking. This is kind of like starting off with the right alloy of steel to make a high quality knife. If the metal isn’t good enough, then the whole project is doomed. However, having a dull, unformed chunk of the right steel is far from the finished product. It takes time (lots of time, really), effort and skill to turn that into a blank, and then form that blank into a shiny, razor-sharp blade. Similarly, the genuinely sober client is a rough blank that I need to shape, polish and sharpen before we’re ready to file a license restoration appeal. Remember, if you lose, you have to wait another whole year to try again, so the stakes are much higher than if you could just keep coming back again and again until you do get it right. To continue with the knife analogy (I had no idea when I thought of it that it would prove so useful…), you’ll note that we called the early product a “blank.” One would certainly start with molten metal in something that resembles a blade shape, if even just a rectangle of sorts. 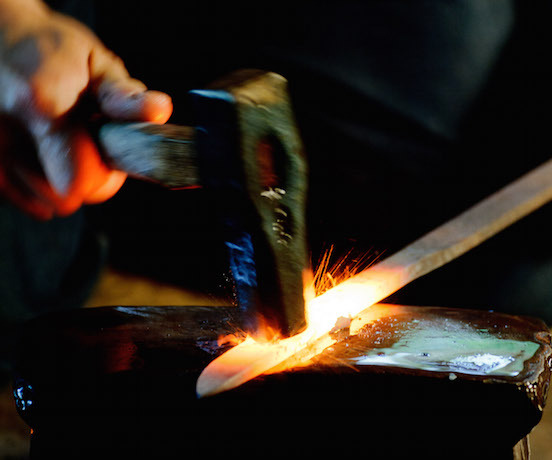 No one would look at a round ball of red-hot steel and think to try and put a handle on it and call it a knife. In the same way, the equivalent of a “blank” in a license appeal client with the potential to win is someone who has really experienced the profound and life changing process of going from drinker to non-drinker. From there, we shape and refine the rough product until it is ready to go, and win. The first step in this “shaping” process begins with my first meeting with a new client. This meeting takes at least 3 hours. This is an important part of what I do that allows me to guarantee your win. The simple truth is that there are no shortcuts to doing things right. This means you have to invest time and effort. Some of my colleagues look bewildered when I tell them that it takes at least 3 hours with a new client to get a case going. Then again, most lawyers shudder at the idea of providing a guaranteed result. I can’t imagine doing anything less. You can’t argue with success, though, and I not only talk about it, I guarantee it. I’ll take that difference all day long. The week before this article was written, I had a new license client show up whose recovery story was long and very involved. My meeting with him took over 5 hours because he needed to go over lots of things that were important to him. From my side of the desk, I honestly need to get to know my client. I need to understand, and not just hear, your recovery story. It’s easy for some lawyer to just think, “yeah, you used to drink and now you don’t; got it,” but that is exactly the opposite of how it should be done. In fact, it is absolutely imperative to remember that every case is unique. This isn’t just a bunch of hot air, either. There are 2 critical experiences everyone has that define true sobriety, and those have to “come out” during the time I spend with my client. Sometimes it takes longer, but we’re here to win, not look at the clock. Let’s go back to the knife analogy: A production made knife costs a fraction of one made by hand, but the quality difference between them is profound in every respect. So is the commitment of time that goes into each. The custom knife maker puts his name on his product, and not only stands behind it, but also is proud of it. He or she wants you to show it off and is happy to have it talked about. Ditto for me in license appeal cases. I love it when people mention me in the same breath that they talk about winning back the ability to drive. Moreover, my former clients will likely be sharing their success with other sober people, so that kind of exposure is good for business. I use a very small circle of top quality substance abuse counselors to complete the substance abuse evaluation that must be filed to formally begin a license restoration case. These are professionals of unimpeachable integrity who not only understand the recovery process, but the license appeal process, as well. As part of my meeting with a new client, I complete a custom document of my own creation that I send with my client to give to the evaluator summarizing the key points from out meeting that directly relate to each line of the state’s substance abuse evaluation form. This is a kind of redundancy, but it’s also that kind of attention to detail, really little details, that underlies my win guarantee. When a client leaves my office, he or she knows exactly what to expect from the substance abuse evaluation, and how to proceed with the evaluator. I don’t care if you’re Einstein, you need to spend a few hours getting a handle on how the things you say, or don’t say, can affect the final outcome of the evaluation. As an aside, it is precisely those people who think they know what to do and how to do it (even though their only connection with the license appeal process is needing a license) who screw it up the most. There is a reason, after all, why so many appeals are denied. I take that risk completely out of the equation when I’m hired. Once the evaluation is completed, it needs to be reviewed. So does the urine screen, and the assessment instrument completed as part of your evaluation. Understanding these things means understanding things like subscales and integrity variables. One of the biggest mistakes made by people who lose license appeals is that they, or, worse yet, their lawyer, simply “sends in” the substance abuse evaluation without going over everything in it line-by-line. The person sending it in not only has to have reviewed it, but done so carefully, and understand exactly what every single word upon it means. In my office, both my senior assistant and I separately review every evaluation that comes in. This, again, is a redundancy, but being careful wins appeals; being less than careful loses them. As I have noted elsewhere, I spend a lot of time reviewing, editing and revising the letters of support. The letters are also critical to a license appeal. There is no way to explain how to do them correctly in an article like this. In fact, it takes more than just a short meeting with a lawyer to get a sense of what to do and how to do the letters correctly. Even if my client is a Pulitzer-prize winning writer, the letters are going to need a lot of work, and that’s my job. As I look back on over 25 years as a lawyer, I think it’s safe to say that over 95% of the letters I see need substantial editing and correction. Add to that the need for the letters to be read as a group, and not just individually, and you can see that just this one facet of the license appeal process takes a huge commitment. Fast forward to the actual license appeal hearing. By the time it rolls around, I need to have my client’s file memorized. For me, it is imperative that I know how many DUI’s he or she has as well as his or her sobriety date. In addition, I need to know who wrote the letters of support and exactly what that person said. The last thing someone needs is a well-dressed lawyer sitting next to him or her at the hearing like some useless ornament. To make sure that doesn’t happen, I have a “prep” session with every client, before every hearing. I make sure my client knows every question that I’m going to ask and that the hearing officer is going to ask, as well. When my client walks into the hearing room, he or she knows exactly what is going to happen. When we meet at the hearing office, there is no need to go over anything because we’re both more than adequately prepared. Good work is the key to good results. It begins with a genuinely sober client, but it takes a lot of time and effort to turn the raw materials of a successful license appeal into the refined and finished product of a new driver’s license that you slide into your wallet. Sure, I’m proud of my guarantee, but I am understandably far more proud of the work I do that goes on behind it. If you’re ready to get back on the road, have really quit drinking, and want the comfort of a guaranteed win in your license appeal case, call my office at 586-465-1980 anytime M-F, from 8:30 to 5 (eastern standard time) and we’ll be glad to answer your questions and explain the license restoration or clearance process to you.